I like to wear makeup but I don’t like to look like I am wearing makeup, or at least a lot of it. I like to go with the whole “less is more” philosophy but in my case still end up spending 15 minutes in the bathroom and almost missing my train EVERY SINGLE MORNING. They should come up with a product that keeps you from missing your train. Oh yeah, it’s called a clock. Anyhoo, here are my favorite makeup items that help with achieving the minimal make up look. 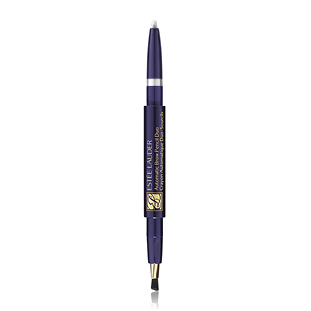 I like Estee Lauder’s brow pencil a lot because it is very natural looking and you have a lot of control. I use this in soft brown because it matches my natural eyebrow color nicely. It has a soft pencil on one end and an angled brush on the other end to blend the pencil in. This is probably on the pricier end for an eyebrow pencil ($23.50) but as eyebrows frame your face I really think this is worth the splurge and it lasts for a loooong time. I think eyebrows should be defined but shouldn’t look unnatural. People notice that kind of stuff. And talk about it. You don’t want to be known as the girl with the crazy eyebrows. 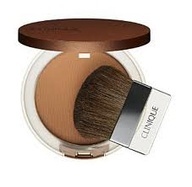 I feel weird if I walk out of the house without a little bronzer and I don’t know if I am lazy or what but I have been using the same bronzer by Clinique for years. 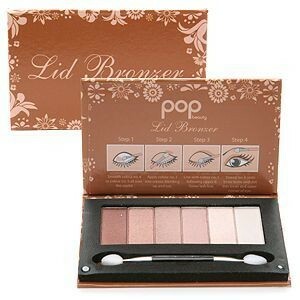 This one is very natural looking and the color is not orange or too shimmery which is a big plus for my fair skin. One downfall – the packaging could be better – the past two compacts I bought have broken within a month of buying, which is lame and annoying. Sigh, sometimes you don’t pick who you love, sometimes love picks you. $25 smackers. Hands down this is my favorite Mascara of all time. I don’t think I can say it any stronger than that. When you crack open a new tube it’s a little gloppy at first but, this Mascara just gets better and better over time. Once the formula dries out a little I am able coax out some awesome eyelashes out of this stuff and I have pale puny eyelashes that betray my Nordic heritage. The only thing is – I think $26 is a lot of money to plop down on something you are supposed to replace after three months so I am always on the prowl for mascara I like just as much and that I don’t feel wasteful for tossing after three months (or four or five, I lose track). I have tried many other loves but always come back to this Holy Grail concealer. I use the #1 shade in the winter and the #2 shade in the summer if I can manage to get a tan. The color goes well with my skin tone and gives excellent coverage. The texture is great too and blends very well. Lately I have been using the smoothing stick in combination with the Neutragena’s Healthy Glow Sheers in fair to light and think the combo looks great. You could also use this product on its own and it will look perfectly fine. $6.50. I really love highlighter and think that even using a little bit can make such a huge difference. I recently rediscovered highbeam after taking a yearlong hiatus to try out other brands. I think in the past I thought that this was too pink but it is really not and when placed strategically on the cheekbones, nose or corners of the eye it can make you look a gazillion times better but not in an over –the-top way. 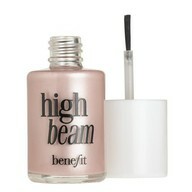 High Beam is very easy to use and smoothes on very easily. I actually like the sample size of this better than the full size because the brush is smaller and you are less likely to go overboard (which is easy to do with highlighter). $26 big ones. I got sweet talked into buying this eye shadow pallet at Ulta last year and it has been one of the best make up purchases I’ve ever made. The pallet contains 6 really pretty colors –ranging from light cream, a shell pink, a purple taupe, a brownish taupe, copper and dark copper. Any of these shadows would work by well just by themselves or together if you want to get all fancy with it. The shadow itself goes on very easily and has a nice shimmer. It’s a very easygoing eye shadow collection. Honestly, the packaging could be better (it’s cardboard) but that has never stopped me. $22. Any old brown eyeliner will do really, I’m not picky. I never know the names of the eyeliners I buy. Maybe this will change but I have tried many over the years – high end, low end and they all seem to work the same and I like them all about the same. What are your holy grail make up items? Next up – Secret Weapons! What?!! My motto with makeup is “if it doesn’t go on at the red lights, it doesn’t go on.” I drive to work. So, there are just a few things I use to get the most bang for my 120 seconds. NYC ( New York Color) eyeshadow is one. I just started using it. I actually just started wearing makeup with color last fall, I took a break after high school – those experimental years were that frightening. The reason for NYC is because 1. A friend gave it to me 2. It’s color coordinated for hazel eyes. This is all really easy for me, and I like easy. I’m the gal who doesnt even know what highlighter is – it looked like nail polish to me [sorry Notes, but that’s why I really need you]. My other Holy Grail item is my eyelash curler. We’ve never parted, I’ve taken it to four continents, and if my house is on fire, it’s probably what I’ll make a beeline for. This tool is what keeps people from asking, “Are you feeling alright.” If there is a good story on NPR, and I space on my regime, I will take five seconds in the parking lot to get my curl on. I’m definetly going to check out your suggestion for mascara. Please keep us posted when something cheaper comes across your radar. I see a guest blogger post in your near furture Kelly! I’ll be happy just to be a common commentor. I really like Lancome’s “Vue” eyeshadow. It’s a great neutral shade with some shimmer. I’m with you Kelly – my eyelash curler is my best friend as I also have Gnat’s teensy Nordic lashes. They are the only hairs left on my body that are still blonde. Very unfair! I’ve been known to curl with my fingernails in a pinch. I use a lancome powder too. My basic is mascara, vue eyeshadow and powder (sometimes a mac concealer which I don’t love but I have it so I use it). I think I need some lessons next time I see you Gnat! 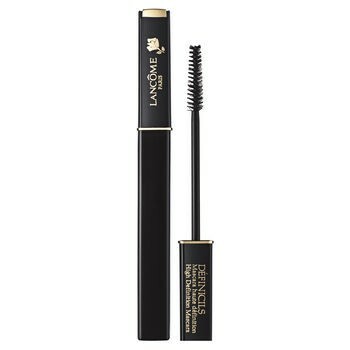 Oh and I use Maybelline great lash mascara! I also have an expensive brand but I use the maybelline more . . . cheap! Thanks for validating my elc dependence. Maybelline great lash, I’ll check it out. Um. How could I have forgotten the eyelash curler! Shu Uemura is my favorite one. I will include that on my beach post coming soon.